Miranda France in her book Bad Times in Buenos Aires said that to live in Argentina was ‘to live at the end of the world’ (1998, p.57). Yet traveling through the vast landscape of San Luis province on my way to Casa Tierra in San Francisco del Monte de Oro, I felt like I was in the middle of a huge and diverse continent – which did not need to care where it was in the world. 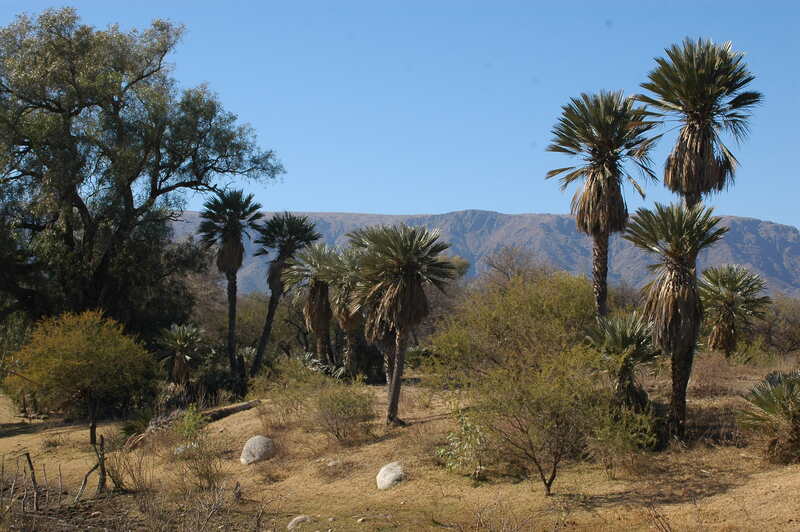 It had mountains (the Sierra de Comechingones), a huge blue sky, fertile soil and a fresh beautiful air. San Francisco del Monte de Oro is a small rural town nestled between two hill ranges. 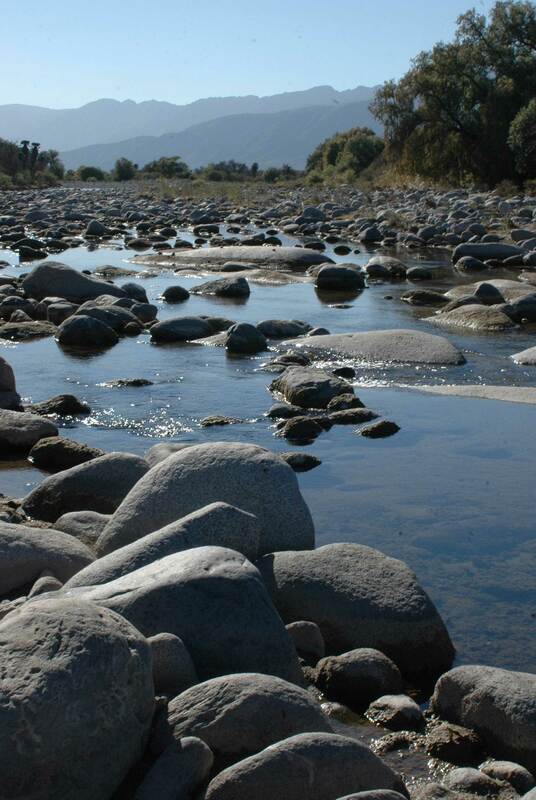 Two hours from the nearest small city it is rustic with its dirt roads, simple single storey houses, plain but elegant Plazas, numerous food shops, and, to the east, a powerful river surrounded by palm trees. It used to be bigger in years gone by, though now the tourist industry is coming to town and a new bus terminal glimmers in the anticipation of their arrival. Casa Tierra, just to the north of the town, is the almost complete home of Nathalia and Diego Ruiz. 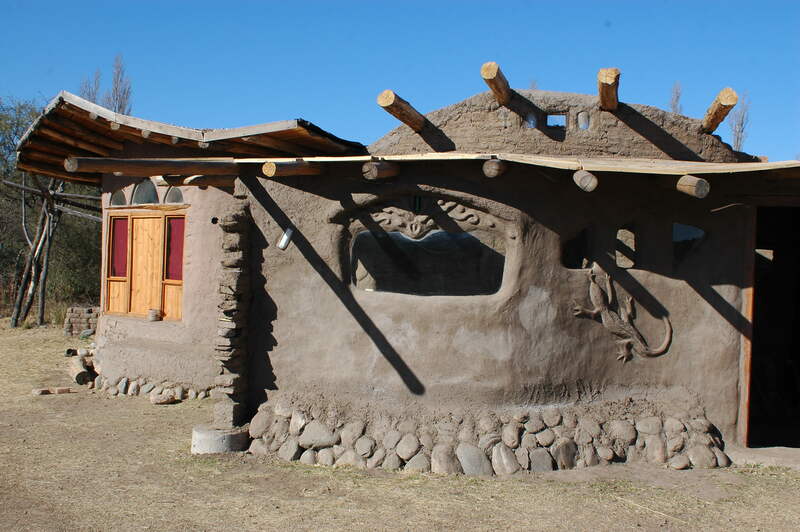 It is an adobe house which curves towards the north with a living roof, a separate office and library building (Lak’a Uta, meaning earth house), and a separate wattle and daub bathroom block. 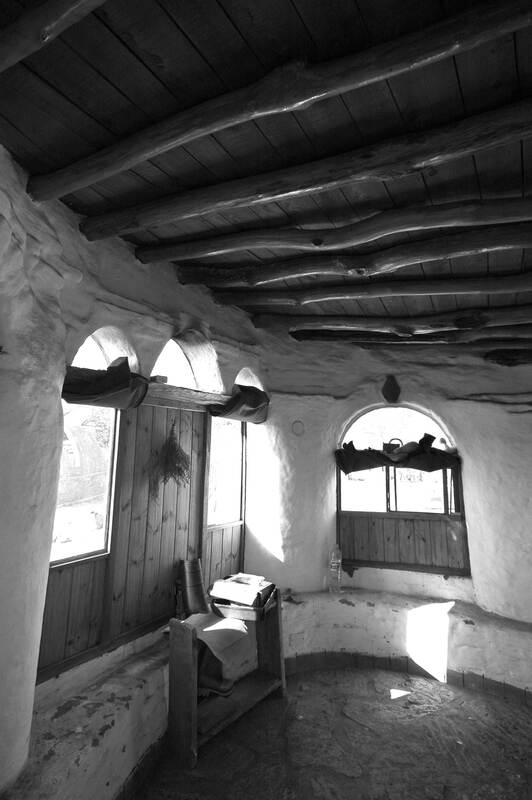 The Lak’a Uta has no wood in its construction; instead it has a curved adobe roof designed by Jorge Belanko and look of an old Moroccan building. These buildings are all incredibly aesthetically pleasing, with details of lizard designs on the wall, coloured bottles casting light inside and curved glass windows looking out on the countryside beyond. 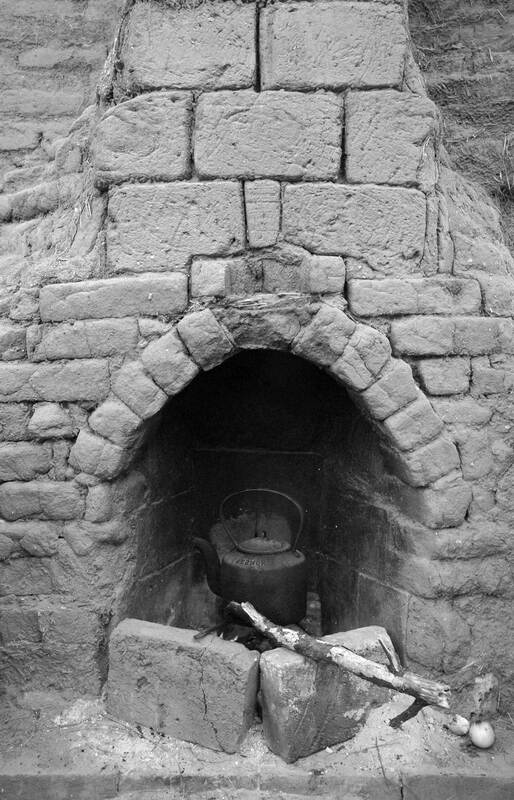 Inside, the curved spaces invite sitting and the fire place warms the room as well at the kettle. Despite not yet having a finished roof it already feels like a place to peacefully dwell. 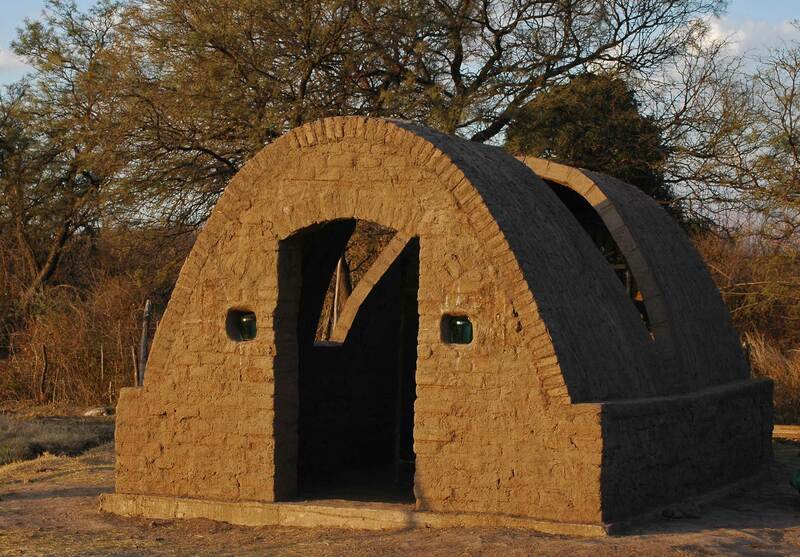 They chose to build in clay because it was cheap (rejecting the need for a 30 year mortgage for a tiny flat in the city), local, you can build curved walls, and it is easy (it forgives mistakes and can be easily maintained and repaired). Since building the living roof they have decided to avoid using wood as much as possible because it is very expensive and is not available locally. Similarly they rejected using straw because it is not easily available. 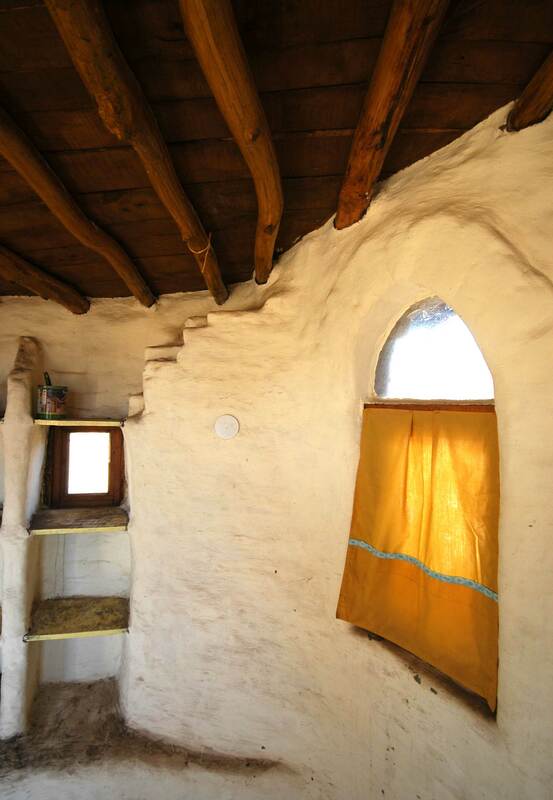 If they chose to build adobe mainly because of cost they have also sought to make their build affordable by using workshop participants as cheap labour: “If we needed to pay builders natural building is not much cheaper than a conventional house. Labour is the same or more. Costs are a third materials but two-thirds in labour” (Diego). So they have only spent AR$ 5,000 (Argentinian pesos, £800) on the build. All they have had to buy is wood, glass, bags for the foundation (which they filled with rocks), some sand and some earth. Recently they have bought unfired clay bricks from the local brick factory because they are cheap and it saves them a great deal of time. In other words, the time savings are worth the cost and with similar justification they have occasionally used concrete if it saved them a week’s manual work. This build has not been quick – interrupted by having children, the necessity to make a living and a commitment to providing inspiring workshops which has meant starting a new building before others are complete in order to teach new skills. This time, of course, increases costs but has greatly enhanced their relationship with the local community and allowed them to experiment and alter their design. Their house is not big because it is deliberately designed around function, not objects or action. When people first design a house they often create a huge dwelling believing “that every actions needs a room when it should be about function and a room can be used for several functions” (Nathalia). Obviously the bigger the house the harder it is to heat and as the temperatures can go below freezing at night here in winter, and fuel is expensive or has to be collected manually, it is important to find a simple way to heat your house. But needs also often change in life and Casa Tierra has been designed so that it is relatively easy to add rooms, which is what they have done as their family has expanded. The need for ease of use while looking after a young child and another on the way has also triggered them to build an internal bathroom (whereas previously all infrastructure was in a separate building). Building has been a very collective process at Casa Tierra. Nathalia estimates that 150 people have helped build their home in some way and that this collective approach has been incredibly important for the sociability, personal connections, fun and support, and enables a focus on the actual building process because the support roles of cooking and cleaning are shared. Nathalia and Diego learnt themselves through several workshops in Patagonia (southern Argentina) and chose adobe to build partly because it is easy to teach others; you do not need to be an expert. Out of the 150 people who helped them build only 20 had previous building experience. Most importantly in terms of skills they believe in the importance of practical learning; learning through doing, feeling the materials, and understanding their attributes. For them it was especially important because they had no practical training and are from non-building backgrounds, highly intelligent but with their career experience in offices in Buenos Aires. So they value practical experience and in so doing see this as a critique of the current education system which does not provide people with the necessary skills for survival. Consequently, they place great emphasis on running workshops to teach others the necessary skills for building. Although their principle aim has simply been to provide a home for themselves, Nathalia and Diego have always sought to do this in a publically accessible way which might lead by example. They have sought to have ongoing conversations with local communities and encouraged visitors – always letting them know what they are doing and why. They are keen not to take on the role of convincing others that their ideas are superior. Rather they hope to make people aware that other solutions – to cold dark houses, or a dwindling supply of firewood – are available. They have done this by sharing workshops with locals, when natural building teachers visit they arrange a session open to all in a local school, and are seeking to work with community groups. They have almost finished building a library of eco-building and permaculture material. Their strategy then is to lead by example, illustrate through practice what is possible and most importantly not overcomplicate their message. Keeping things simple is essential in a small rural town where most people have very little, but basic needs which are often not met. So “we want to solve our needs in the most simple way and then share that. Not in a theoretical approach, but totally practical. We need to show it in practice” (Deigo). This approach seems to be working with locals asking their advice on building and a recent open meeting being well attended. Many locals had mud houses historically and their grandparents built using mud, but it came to be viewed with shame, as representing the housing type of poor people and thus many aspired to a red brick house instead emulating ideas imported from Europe by the rich of Buenos Aires many decades ago. The traditional mud houses made using mud bricks were square dark buildings which although warm in winter and cool in summer where not the most inspiring to spend long periods of time in. 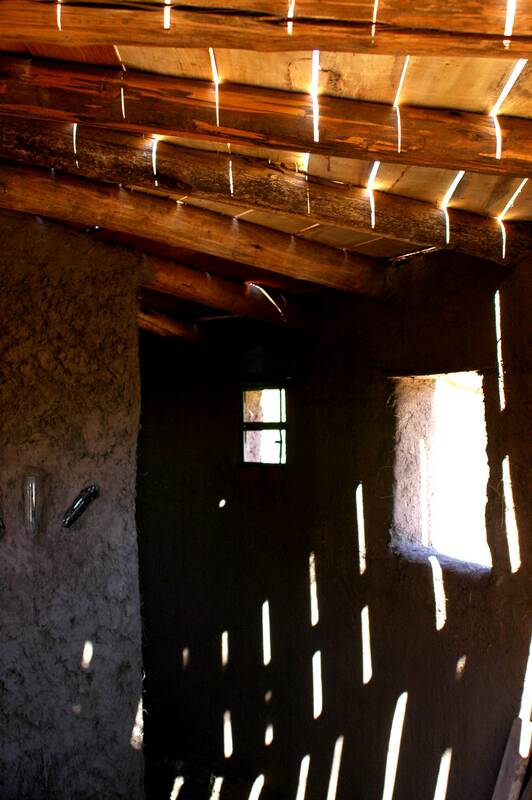 Instead the new natural building movement wants to modify this technique to create brighter and more aesthetically pleasing homes, but illustrate that this builds upon, rather than rejects, this earlier tradition. In this way it helps give value to locals’ skills and heritage that have been rejected by many contemporary architects, planners and councils. In building they also used the traditionally local technique of adding cows’ blood to the external plaster which apparently works wonders as a waterproofing and protections agent. 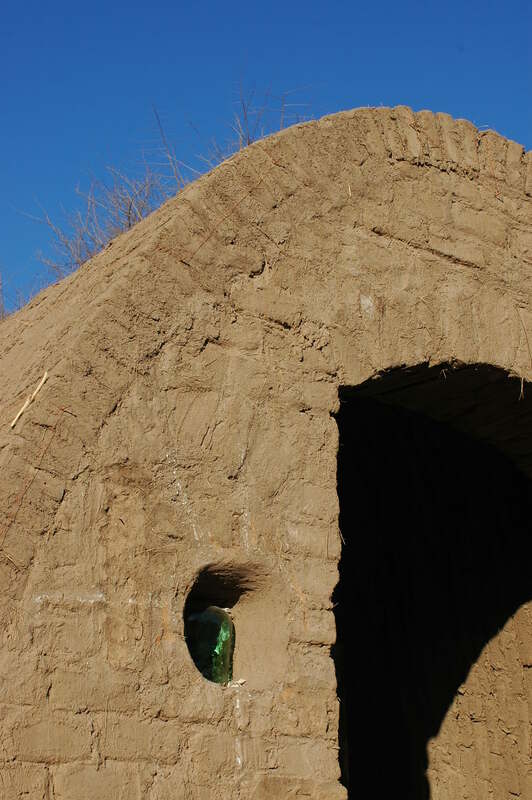 This move to building earthen homes once more is in large part due to the need to build houses suitable for the bio-climate using local resources. This attention to climate is reflected in the lack of south-facing windows (where the harsh winds and rains flow up from Patagonia) and large windows to the north (which being in the southern hemisphere is where they benefit from passive solar gain). With large roof overhang the house still remains shaded for many of the summer months, but catches the lower warming sun in winter. Refreshingly gender has been acknowledged here as an important issue in eco-building, Perhaps ironically for a traditionally patriarchal society which still maintains much of its machismo, the Ruiz’s were first taught natural building by two women (a course organised by Kleiwerks [link]) and think it is important that women are specifically encouraged to realise the possibilities of building in a culture where it is considered strong and heavy work and thus a masculine activity. They believe it is about both genders understanding and knowing their own bodies and its limitations – that there are men too who doubt their capacity to do manual labour. 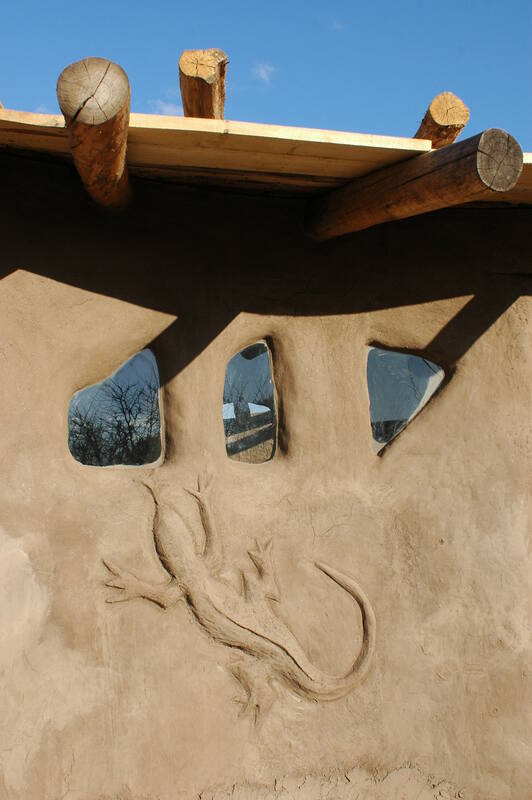 Moreover, it could be argued that many aspects of natural building challenge a macho way of doing things, that it involves a sensitivity of touch with materials which are soft and malleable and the effects of clay can often be subtle. So building becomes about more than physical work but creative judgement; which both genders need to learn and practice. For many it is simply about confidence and seeing that others like yourself can do it which stimulates a self-belief – thus the importance of practical learning and workshops run here. 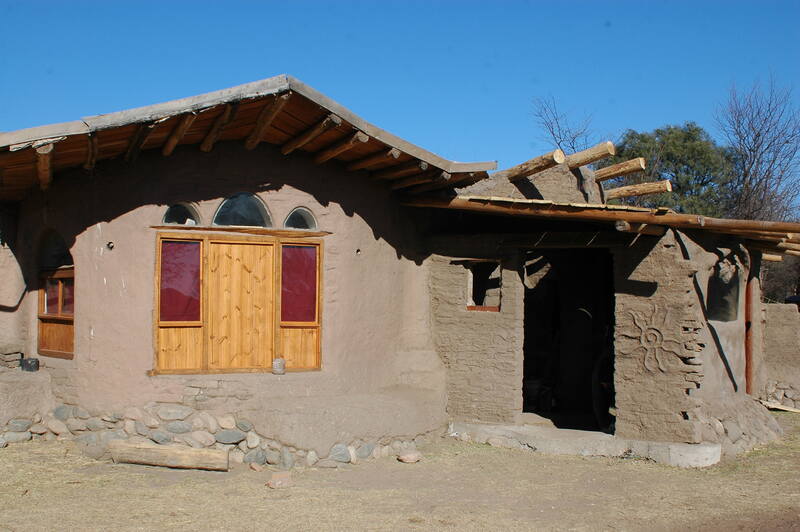 The Ruiz’s purposefully chose to build clay in San Francisco del Monte de Oro because of its tradition of clay building, unlike Merlo to the north where there is perhaps a bigger ecologically-minded community, but very restrictive planning and building regulations. Technically five blocks north of the town their plot is considered pampa (countryside) and thus building regulations are unlikely to ever apply here. 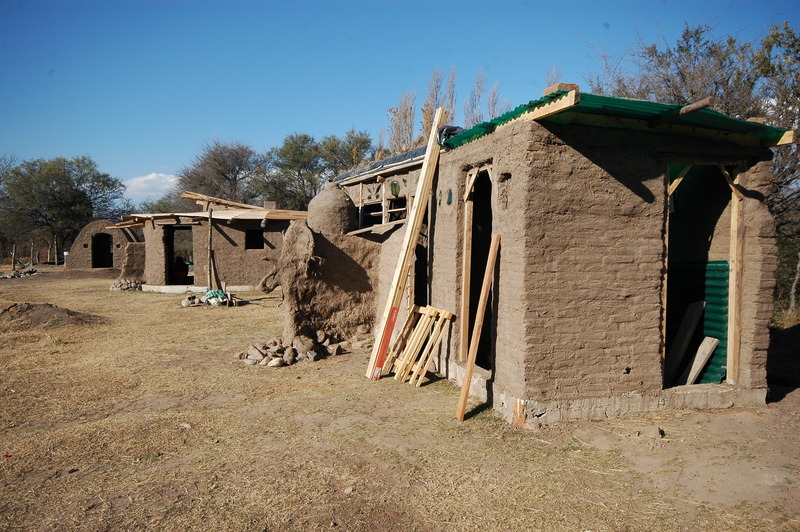 But regulations are being formulated for the town itself (as tourist development is expanding) and Nathalia and Diego are keen to ensure that clay buildings are formally accepted, perhaps even advocated, within these regulations. So part of their role is to positively influence the emerging legislation before, like in some other regions, clay housing is excluded from permissible building (one such house, in another region, has already had to be demolished because of regulations). Building in rural Argentina can be a lonely process and Casa Tierra has relied upon, and benefitted enormously, from an international support network which has provided solidarity, knowledge and emotional support when times have felt tough. As Nathalia said “at times I thought it was just an interesting chapter in life and then we would move on” but the support enabled them to preserve and flourish. That said, the strength and courage with which they have approached this build and their commitment to and generosity in sharing their knowledge and skills is itself a huge inspiration for low-cost building everywhere. Casa Tierra accepts visitors for tours, and volunteers through the WOOFFing network. If you would like to visit be sure to contact them in advance rather than simply arrive as they often have commitments. They also run workshops on natural building; details are on their website. Contact via email: fundacion@yanantin.org.ar, or via the website: www.casatierra.org.ar. For directions see How to find … Casa Tierra. Miranda France en su libro Malos Tiempos en Buenos Aires (Bad Times in Buenos Aires) dijo que vivir en Argentina era vivir “en el fin del mundo” (1998, p. 57). Sin embargo, viajar por el gran paisaje de la provincia de San Luis camino a la Casa Tierra en San Francisco del Monte de Oro, sentí que estaba en medio de un gran y diverso continente, el que no necesitaba preocuparse sobre donde estaba en el mundo. Tenía montañas (la Sierra de Comechingones), un gran cielo azulado, tierra fértil y un aire puro y fresco. San Francisco del Monte de Oro es un pequeño pueblo rural ubicado entre dos cordilleras. A dos horas de la pequeña ciudad más cercana es rustica con sus carreteras de tierra, sus casas simples de un piso, sus Plazas sencillas pero elegantes, numerosas tiendas de comida, y en el este, un poderoso río rodeado por palmeras. Solía ser más grande en años anteriores, pero ahora la industria turística se esta estableciendo en el pueblo y una nueva terminal de autobuses brilla de anticipación ante su llegada. Casa Tierra, justo al norte del pueblo, es la casa de Nathalia y Diego Ruiz que casi esta terminada. 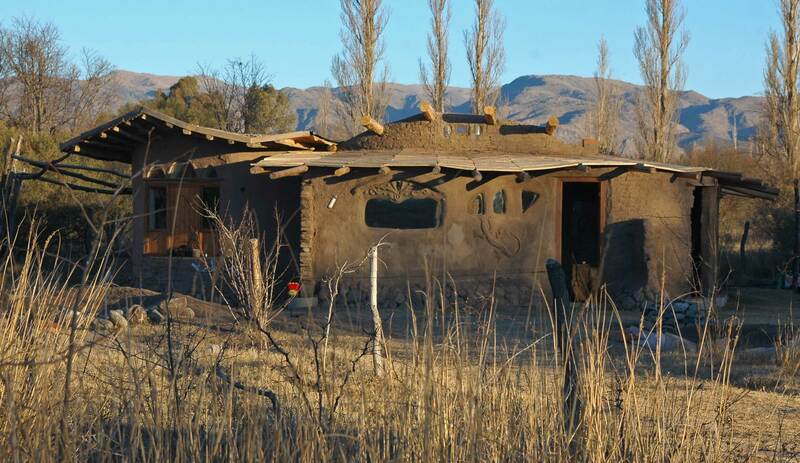 Es una casa de adobe que da vuelta hacia el norte con un techo verde, una oficina separada y la biblioteca un edificio con el nombre de Lak’a Uta, que significa casa de tierra; un bloque separado zarzo y embadurnado que es el baño . 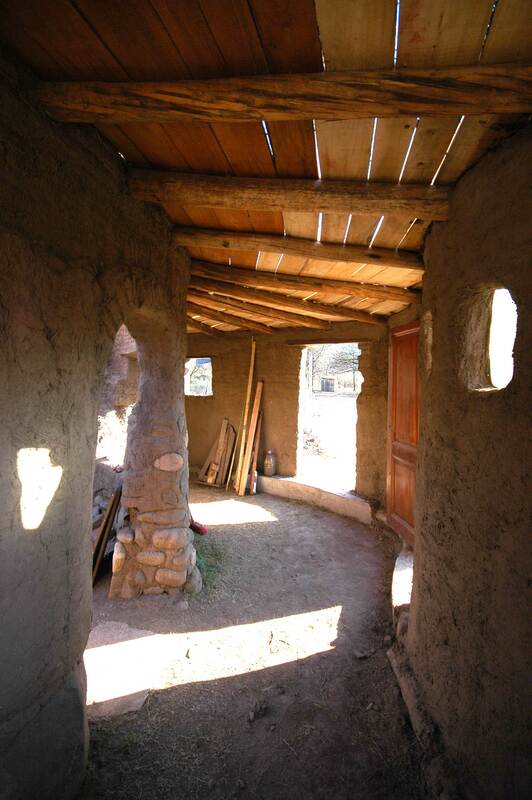 La Lak’a Uta no tiene madera en su construcción, en lugar tiene un techo ondulado diseñado por Jorge Belanko y tiene el aspecto de un viejo edificio de Marruecos. 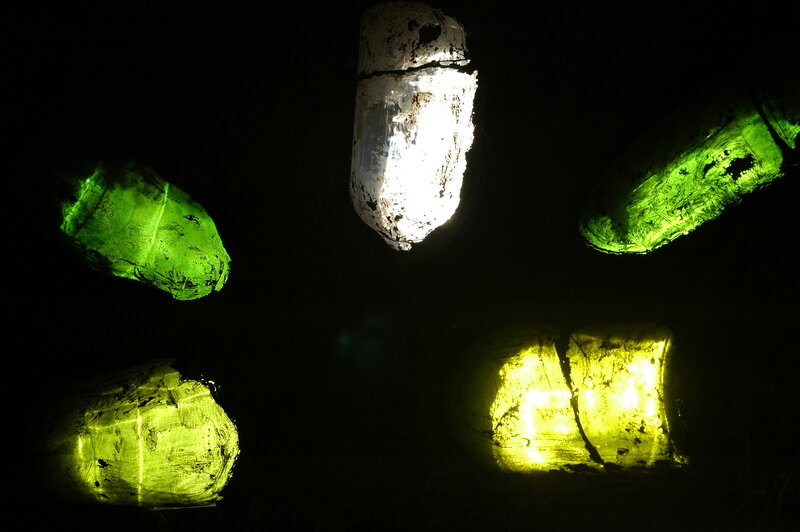 Todos estos edificios son increíblemente agradables estéticamente, con detalles de lagartijas en las paredes, botellas de colores distribuyendo luz dentro de los edificios y ventanas con vidrio ondulado con vista hacia más allá del campo. 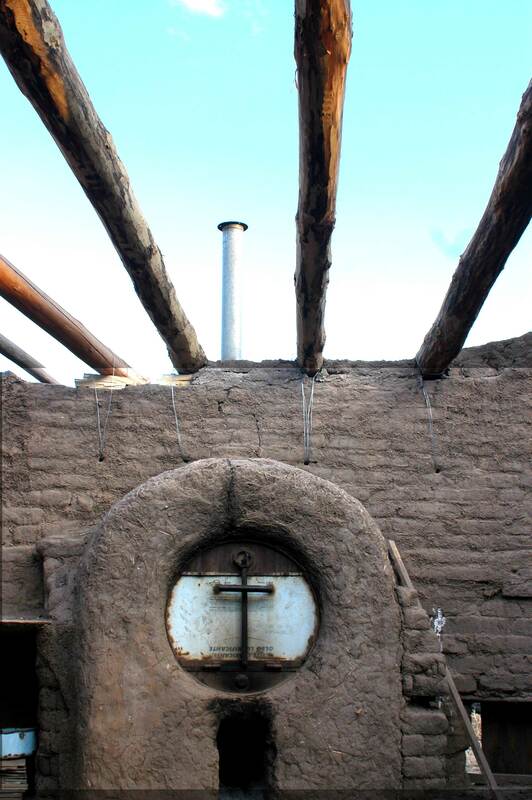 Adentro, los espacios curvos invitan a sentarse y las chimeneas calientan las habitaciones al igual que la tetera. Aunque no se haya terminado el techo, ya se siente como un lugar donde se puede vivir tranquilamente. Rechazando la idea de sacar una hipoteca de 30 años por un pequeño apartamento en la ciudad, ellos decidieron construir con arcilla, ya que es mas barato, el material es local, se pueden construir paredes curvas, y es fácil: perdona errores y el mantenimiento y reparo es fácil. Desde que decidieron construir el techo verde han decidido evitar el uso de madera lo más posible porque es muy caro y no esta disponible en el área. Igualmente, rechazaron el uso de paja porque tampoco se puede conseguir con facilidad. Además de decidir construir con adobe, específicamente por el costo, también buscaron hacer la construcción mas económica al utilizar participantes de talleres como mano de obra: “Si necesitábamos pagar albañiles, casas naturales son mucho más baratas que casas convencionales. El trabajo es el mismo o más. El costo es un tercero en materiales, pero dos tercios en mano de obra” (Diego). Por lo tanto ellos solamente han gastado $5,000 pesos Argentinos (£800 libras esterlinas) en la construcción. Todo lo que ellos han tenido que comprar es madera, vidrio, bolsas para la fundación las cuales están llenas de rocas, algunas de arena y otras de tierra. Recientemente compraron ladrillos de arcilla secados bajo el sol de una fabrica de ladrillos local porque son baratos y ahorran tiempo. En otras palabras, el ahorro de tiempo vale la pena y con la misma escusa, en ocasiones, han usado concreto si les ahorraba el labor de una semana. Esta construcción no ha sido rápido – interrumpida por tener hijos, la necesidad de trabajar y su compromiso de proporcionar talleres inspiradores lo cual ha significado el iniciar la construcción de un nuevo edificio, antes de completar otros, para poder enseñar nuevas técnicas. Esta vez, claro, los costos aumentan pero ha aumentado su relación con la comunidad del área significativamente y les ha permitido experimentar y alterar su diseño. Su casa no es grande porque esta diseñada deliberadamente en relación a su funcionalidad, no a sus objetos o actividad. Cuando las personas diseñan una casa, ellos normalmente crean una gran habitación creyendo “que cada actividad necesita una habitación cuando debería de pensarse sobre la funcionalidad y que la habitación puede tener varias funciones” (Nathalia). Obviamente entre más grande la casa lo más difícil es calentarla y conforme las temperaturas pueden llegar a ser extremadamente frías por la noche durante el invierno aquí y el gas es caro o debe de ser reunido manualmente es muy importante el encontrar una manera simple para calentar la casa. Pero las necesidades también cambian frecuentemente en la vida y Casa Tierra ha sido diseñada de una manera en que sea relativamente fácil agregarle habitaciones, lo cual han hecho conforme su familia ha crecido. La necesidad de acceso mientras cuidan de su hijo menor y otro en camino también ha hecho que construyan un baño interior; mientras que anteriormente toda la infraestructura del lugar era de edificios separados. La construcción ha sido un proceso colectivo en Casa Tierra. Nathalia calcula que 150 personas han ayudado en la construcción de su casa de alguna manera u otra y que este enfoque colectivo ha sido sumamente importante para la sociabilidad, conexiones personales, diversión y apoyo, y ha permitido el enfoque en el proceso actual de la construcción porque el papel de apoyo entre la cocina y limpieza son compartidos. Nathalia y Diego han aprendido a través de varios talleres en la Patagonia (Sur de la Argentina) y escogieron adobe para construir en parte porque es fácil para enseñar – no se necesita ser un experto. De las 150 personas que los ayudaron a construir, solamente 20 tenían experiencia en construcción. Lo más importante en relación a habilidades, según ellos era aprendizaje a través de práctica: aprender a través de hacer, tocar los materiales, y entender sus atributos. Para ellos era especialmente importante porque ellos no tenían entrenamiento práctico y no tenían conocimiento sobre construcción, sumamente inteligentes pero con experiencia profesional en oficinas en Buenos Aires. Por lo tanto ellos valoran la experiencia a nivel práctico y esto ellos lo ven como una crítica hacia el sistema educativo actual, el que no provee a las personas con las habilidades necesarias para sobrevivir. Consecuentemente, ellos ponen gran énfasis en crear talleres para enseñar a los otros las habilidades necesarias para construir. Aunque su principal interés ha sido el crear un hogar para si mismos, Nathalia y Diego siempre han buscado el hacer esto de una manera públicamente accesible, lo cual puede servir como ejemplo. Ellos han buscado mantener conversaciones con comunidades locales e inspirar a visitantes – siempre dejándoles saber lo que están haciendo y por qué. Ellos están inclinados a no tomar el papel de convencer a otros de que sus ideas son superiores. Todo lo contrario, ellos esperan informar a las personas sobre otras soluciones están disponibles para casas frías y oscuras o un escaso subministro de madera. Ellos han logrado esto al compartir talleres con personas de la comunidad; cuando profesores de edificios ecológicos visitan, ellos planean sesiones para todo el quien quiera llegar en la escuela local, y están buscando trabajar con grupos comunitarios. Ya están a punto de terminar la construcción de la biblioteca de material de edificios ecológicos y material de permacultura. Su estrategia, por lo tanto, es dar ejemplo, ilustrar a través de practica lo que es posible y lo más importante no complicarse con su mensaje. Mantener las cosas simples es esencial en un pequeña pueblo rural donde muchas personas tienen poco, solo las necesidades básicas las cuales varias veces no se satisfacen. Por lo tanto “nosotros queremos solucionar nuestras necesidades de la manera mas simple y compartir eso. No con una aproximación teórica, sino que práctica. Necesitamos mostrarlo en la aplicación” (Diego). Este acercamiento parece funcionar con las personas del pueblo que piden sus consejos sobre construcción y una reunión abierta recientemente fue muy bien recibida. Muchos de los residentes tenían casas de barro históricamente y sus abuelos construían usando barro pero llegaron a ser vistas con vergüenza, representando el tipo de vivienda de una persona pobre, por lo tanto muchas personas aspiraron a cosas con ladrillo rojo en lugar, imitando las ideas importadas de Europa por las personas ricas de Buenos Aires de generaciones pasadas. Las casas de barro tradicionales hechas con ladrillos de barro eran edificios cuadrados oscuros, que aunque eran calientes en el invierno y frescas en el verano, no eran las más deseables para pasar grandes periodos de tiempo. Sin embargo, el nuevo movimiento de casas naturales quiere modificar esta técnica para crear casas más creativas y estéticamente atractivas para que no las rechacen aunque se basen en la construcción de la tradición previa. De esta manera, se ayuda a valorar las habilidades y herencia de los residentes que han sido rechazados por muchos arquitectos contemporáneos, planificadores y autoridades. En construir de esta manera, ellos utilizan técnicas tradicionales de agregar sangre de vaca como yeso externo, el cual aparentemente funciona de maravilla para impermeabilización y agente protector. Esta estrategia en construir de nuevo hogares de barro es en parte debido a la necesidad de construir casas apropiadas para el bio-clima usando recursos locales. Está atención al clima esta reflejada en la falta de ventanas viendo hacia el sur, donde los vientos duros y las lluvias de la Patagonia provienen; y las grandes ventanas hacia el norte, por las que estando en el hemisferio sur es donde se benefician de la pasiva ganancia solar. Con techos largos encima, las casas aun consiguen sombra durante los meses del verano, pero aun logran alcanzar el pequeño calor del sol durante el invierno. Refrescantemente genero se ha reconocido aquí como un tema importante en la eco-construcción, tal vez, irónicamente, para ser una sociedad patriarcal que aun mantiene mucho de su machismo, los Ruiz aprendieron sobre construcción natural por dos mujeres (un curso organizado por Kleiwerks [link] ) y piensan que es importante que las mujeres sean particularmente alentadas para que se den cuenta de su potencial para construir, dentro de una sociedad en donde construcción es una actividad considerada como un trabajo pesado y fuerte, por lo tanto, un trabajo para hombres. Ellos creen que es sobre los dos géneros, que ambos entiendan y conozcan sus cuerpos y sus limitaciones – que también hay hombres que dudan sobre su capacidad para hacer trabajo manual. De igual manera, se puede discutir que muchos aspectos de casas naturales desafían al macho en la forma en que hace las cosas, ya que requiere un toque delicado con los materiales que son suaves y moldeables y los efectos de barro muchas veces pueden ser sutiles. Por lo tanto, construir se convierte en algo más allá que trabajo físico si no que también requiere criterio creativo, lo cual ambos sexos necesitan aprender y practicar. Para muchos es solamente cuestión de confianza y ver que otros al igual que uno pueden hacerlo lo cual estimula auto-confianza – por esto la importancia de aprender durante la practica y los talleres que ofrecen. Los Ruiz apropósito decidieron construir con arcilla en San Francisco del Monte de oro por su tradición en la construcción de barro, lo contrario a Merlo en el norte donde tal vez hay una mayor comunidad ecológicamente conciente, pero con mayores restricciones en planificación y reglamentos en construcción. Técnicamente 5 cuadras norte del pueblo de su terreno es considerado pampa (campo) y por lo tanto las regulaciones para construir son poco probables en aplicarse en esta área. Pero regulaciones se están formulando para el pueblo, ya que la industria turística esta creciendo, y Natalia y Diego están interesados en asegurar de que las casas de barro sean aceptadas formalmente, talvez si es posible apoyadas, dentro de esta regulación. Por lo tanto, parte de su papel es de influenciar positivamente a la legislación emergente antes de que como en otras regiones, las casas de barro sean excluidas dentro de las construcciones permisibles (una casa en otra región, por ejemplo, tubo que ser demolida por las nuevas regulaciones). Construir en el área rural de Argentina puede ser un proceso solitario y Casa Tierra se ha fiado y beneficiado enormemente, de una red de apoyo internacional que ha proporcionado solidaridad, conocimiento y apoyo emocional cuando han pasado tiempos duros. Como Nathalia dice “a veces yo pensé que era solo un capítulo interesante en mi vida y que luego seguiríamos adelante” pero el apoyo les permitió continuar. Con eso dicho, la fuerza y el coraje con el que se han acercado a esta construcción y su compromiso a ella y generosidad en compartir su conocimiento y habilidades es en sí admirable para casas de bajo-costo en todas partes. Casa Tierra acepta visitantes para tours y voluntarios a través de WOOFFing network. Si desean visitar por favor comunicarse con ellos con anticipación, en lugar de simplemente llegar ya que normalmente tienen compromisos. Ellos también dan talleres sobre construcción natural; detalles están en su página de red. Contactar por correo electrónico: fundacion@yanantin.org.ar, o a través de su página en la red: www.casatierra.org.ar. Para direcciones vea: How to find … Casa Tierra. I think this will be perfect for every house especially nowadays that fire and earthquake is all over. Thanks for sharing and more power! Hello I am Master of Building Construction and Bio teacher. Gsutaría me know I can collaborate on something.